The reggae-fueled Hasidic musician known as Matisyahu (born Matthew Miller) scored a surprise success last year with his second album, the concert disc Live At Stubb's. He's maintained momentum with his latest record, Youth, a Bill Laswell-produced collection of high-energy, textured dance-pop. He's living out a boyhood dream, inspiring people with music the way he was inspired by Phish, the band he followed as a teenager while trying to find himself spiritually. 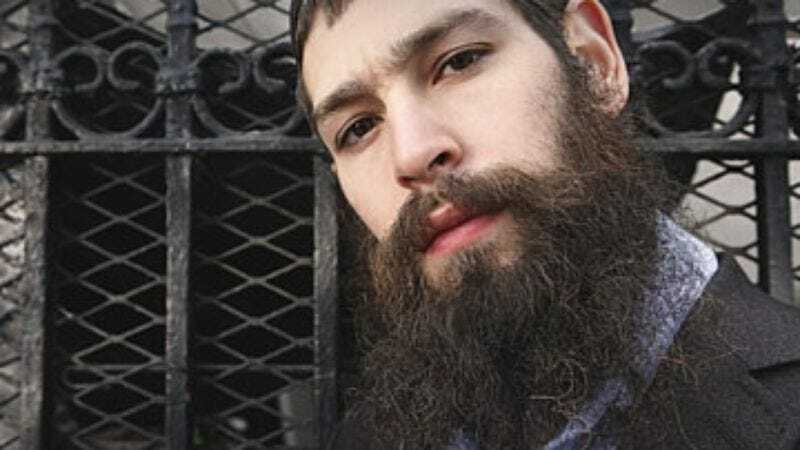 The end result of that quest—a conversion from secular Judaism to the strict tenets of Hasidism—has made Matisyahu a novelty in the music business, and has arguably prompted some of his meteoric success. And yet Matisyahu's religion has never been shtick. He's a serious, skilled musician who happens to be devout, not some latter-day version of 2 Live Jews. During a night off in the middle of his current marathon tour, Matisyahu spoke with The A.V. Club about his musical biography, and how he lives a rock-star life without losing his soul. The A.V. Club: What do you do when you have a night off during a tour? Matisyahu: I have a chavrusa, a friend that I learn with, who I talk with over the phone. So I'll be speaking with him, and I have a couple meetings and interviews. I think there's the possibility of some bowling happening at some point. AVC: Reading about your life, it sounds like a lot has happened to you, between all the moving you did as a kid and all the restless wandering you did as a young adult. And yet you're only 26. M: A lot has happened just in the last two years, actually. I got married, I had a son, I started a career and sold a few hundred thousand records. AVC: How did you get started in music? M: I always had a love of music, from the time I was a little kid, dressing up and singing along with Michael Jackson songs. I was in shows in high school, and then I got into reggae music and Phish and all that stuff, and I had a bongo drum I used to play. Basically, I started beatboxing with friends at lunchtime and after school, skipping class and stuff like that. We'd meet up in a park and everyone would freestyle, and I was the guy who made the beats. From there, I left home and went out on tour with Phish, and I was playing my drum in the parking lot and freestyle rapping and singing different songs that I'd heard. Then I lived in Oregon when I was 18 and started playing music with a guy out there, and played the coffee shops and started a band and played a good handful of shows, maybe 30 shows, in the Northwest. Then I did some acting, went to college, started playing around with the effects on a P.A. system, doing that reggae-chant thing. Did that for a couple years. I'd occasionally get up at an open mike night, and I'd sit in with friends who had bands. Then I went to yeshiva, and when I was in yeshiva and becoming religious, there was a rabbi in Washington Square Park, from NYU. I was very close with him, and I would be there for Shabbos, and he would ask me to sing or rap or something at the Shabbos table, acoustic-style. From there, he asked me to perform at a menorah lighting in Union Square Park, which I did. I ran into an old friend, an acquaintance of mind from college, Aaron Dugan, my guitar player. He had never played reggae before, but he was just a nice guy and I knew he played guitar, so I asked him if he wanted to do this gig with me for, like, 50 bucks or something, and he did. From there, there were gigs within the religious community, like at the youth center. I started charging a few hundred bucks, got a band, and this friend of mine who I knew from college who went to NYU's music business school told me that he was interested in starting a non-profit for Jewish music, and asked if I was interested in maybe making a record for them. In the meantime, when I was in yeshiva, I'd gotten a couple calls to do some shows with a couple other blacks and Jews who do reggae music. I forget the name of the club, but it was one of the first clubs that I went to after I got religious, down in the East Village. That led to an opening gig for a band, John Brown's Body, a Hanukkah show, and that was the first show where we showed up and the place was jam-packed, sold-out, there was a line around the corner. We did a promo show at the Mercury Lounge, it was the same thing, and then we just moved up. We did Irving Plaza, we did Webster Hall. We went out for four months straight in the van, after I'd just gotten married, and we toured around the country and played six nights a week. I got a bunch of press stuff, a bunch of TV stuff, a bunch of good opening acts, festival stuff over the summer. Everything just snowballed. AVC: Did you envision this career path for yourself when you started making music? M: Yeah, since I was about 17, my dream was to be a successful professional musician. I didn't know what instrument, I didn't know what I was gonna look like, but I watched the videos of Bob Marley and everything and thought, "That's what I want to do." I never thought of doing it in a Jewish market only. AVC: Was there a Jewish equivalent to Christian rock when you were growing up? M: Not for me, because I didn't grow up in a religious setting. I grew up pretty secular. I went to public school, and all the Jews that I knew, none of them were religious. While probably half of my friends were Jewish, they were all secular Jews. We went to Hebrew school, we knew we were Jewish, but it wasn't a major part of our existence. Culturally and musically, the music and the food and the clothes that we wore, everything was much more just American. AVC: There is some Jewish pop music, though. M: Within Orthodox circles, there are Jewish artists. They're not very popular, but there is a little niche there. AVC: Do you ever listen to any of that? M: I've never been into it. I've tried to listen to it, but I've never felt it was of quality. AVC: There's apparently been a mini-controversy in the Jewish community over whether you've become too secular. Do you follow any of that? M: No, I really don't. Is that a recent thing? AVC: Some have talked about your video for "Youth" and your live show as being pitched to the mainstream instead of focused on the Jewish community. M: Well, it is. I would agree with that. I never aimed for the Jewish community. I aimed for a mainstream audience, because that's the world that I come out of. I spent 23 years in a secular lifestyle, going to Phish concerts and reggae shows and hip-hop shows and listening to that style of music. My focus has really been on the mainstream people: non-Jews and Jews who aren't necessarily religious. And while there are definitely a lot of religious Jews who get something out of it, they're not my main focus. AVC: So instead of putting reggae into Jewish popular music, you're putting your own spiritual understanding into reggae. AVC: Are there any restrictions in your faith on what you can do when you're on tour? M: The jurisdictions about men being able to touch women. You're only allowed to touch your wife and your mother, so I have to be careful about stuff like that. Obviously, not playing on the Sabbath, Friday sundown to Saturday sundown. I don't partake, really, of any of the typical rock-star-lifestyle things you could think of. I try to be responsible when I'm out on the road. I take it pretty seriously, what I'm doing, as something that's good for the world, and my family, and everyone. AVC: Is everyone in the band as observant as you? M: No. Not everyone is Jewish in the band, either. AVC: Does that cause any friction? M: It doesn't really, because while not all the guys are Jewish or religious, they are relatively spiritual and responsible people. Everyone is really respectful. They don't bring girls onto the bus. Most of them are in long-term relationships anyway. They're not into drugs. They play video games, they listen to music, they exercise… they're like normal guys. They're not necessarily partiers. And they're all doing it for the right reasons, because they feel it's important. AVC: There's been a lot of talk since the last election about the "culture war." With all your emphasis on family and personal restraint, would you consider yourself more right-wing than a lot of other people in your scene? M: No. I recently ran across an interview with Bob Marley in Beat magazine, and someone asked him that, and he said, "I'm not the left, I'm not to the right, I'm to the center. I'm straight-up." I'm not that into politics. I'm religious, and I have a perspective that very much is outlined by the Old Testament, but at the same time, I'm sort of a rebel at heart, sort of a revolutionary. I have different elements to me. I think it's about trying to break out of those boundaries and stereotypes and say, "You can be religious. You can have a family." I have my wife and my son on the road with me. You can be religious and be living on a bus with your wife and your son and, like, six non-religious or non-Jewish people, playing concerts every night… and there's no contradiction there. It can work. Whatever a person wants, whatever a person puts their energy into, there's no closed doors. AVC: But you are trying to say something, even it isn't political. How would you characterize it? M: I'm basically trying to do what music did for me as a kid. As a kid, you heard music, you saw musicians, and it gave you a sense of hope. You heard a song, and you felt that that song understood you, that there was someone else who knew what you were going through as a youth, as a person, as a being. Music has the ability to heal, that ability to give a person hope. To give a person courage and strength, and a certain outlook on the world they live in. A song is a means to take all these separate things, different instruments, different notes, and you string them together and you harmonize, and you make it all come together into one thing. In a certain sense, that's what the world is like. It's this world of lots of distinctions and lots of little details. The idea in Judaism, really, is that it's all one. All part of the same song. When a person listens to a good song, and they can look out at the world and their lives and see the dark and the light, the negative and the positive, all the different elements, all come together in one holistic poem, that is a very healing and very reductive thing, and that's what my music is about. Trying to give that to people. So, whatever I look like to lots of different people, that's actually the message, more than, "Do I side with this group or that group?" AVC: Can you think of a song or an album that gave you that sense the first time you heard it? M: Well, I think for sure Phish, Bob Marley, Allman Brothers. All those concerts I went to when I was a kid, when I saw The Roots, and I saw beatboxing. Nas' album It Was Written. OutKast. They've all had major impacts on my formation as a musician, and as a person as well. AVC: As a musician, can you still get that feeling back, when you hear someone else's music? M: Yeah, for sure, when I hear good music. For example, I'll be sitting around and I'll just hear several notes, like a bassline from some far-off radio, and that'll bring me right away to some emotion. Music has that ability to bring out emotion, even from people who have hearts of stone.